The UUCE Book Club meets monthly on the 4th Wednesday of each month at 7:00. 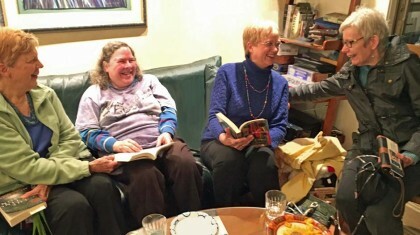 It is a loosely organized group of about 10 -15 people (mostly women although men are welcome) who choose a book to read and discuss. We have been getting together for over 20 years. There is no formal structure to this group, and no official leader. We rotate our meetings at the homes of participants who volunteer to be a host. Occasionally we meet at the church. Notices of meetings are put in the Beacon with the name of the book and the phone number of the host for any given month. We try to select a variety of books and authors including, fiction, biography, classics, young adult and best sellers. Sometimes we use the “Book Club in a Bag” from the Public Library. If you would like to know more about the Book Club, please call the church office at 814-864-9300 for contact information.